The GOP-led House voted late Wednesday afternoon to repeal the sweeping health care overhaul legislation passed last year by congressional Democrats and signed into law by President Obama. The vote, which fulfills a Republican campaign pledge from the midterm elections, will likely have no substantive impact. That's because there is virtually no chance the Democrat-led Senate will take up the bill or that Mr. Obama would sign it. Still, Republicans insisted before the vote that their action was not in vain. Rep. Michele Bachmann of Minnesota, who said the law amounts to "the crown jewel of socialism," said House Republicans "have a message" for those "who think this may be a symbolic act." "This is not symbolic, this is why we were sent here," she said, "and we will not stop until we repeal a president and put a president in the position of the White House who will repeal this bill, until we repeal the current Senate, put in a Senate that will listen to the American people and repeal this bill." The final vote tally was 245 to 189 in favor of repeal, with three Democrats voting with the Republican majority. The three Democrats voting for repeal were Rep. Dan Boren (OK), Rep. Mike McIntyre (NC) and Rep. Mike Ross (AR), all of whom voted against the health care bill last year. Ten Democrats who voted against the bill last year and won reelection declined to vote to repeal it. No Republicans voted against repeal. The only member not to vote on the bill was Democratic Rep. Gabrielle Giffords of Arizona, who is recovering from an assassination attempt. House Speaker John Boehner argued on the House floor before the vote that the health care legislation is costing jobs and will add to the deficit. The Congressional Budget Office estimates that the repeal bill would actually increase the budget deficit by $230 billion over a decade, but Republicans maintain that the estimate does not take into account all of the costs of the measure. "Let's stop payment on this check before it can destroy more jobs and put us in an even deeper hole," he said. "Then let's work together to put in place reforms that lower costs without destroying jobs or bankrupting this government." Republicans plan to draft alternative proposals in the coming months as part of their effort to build a credible package of replacements to the current law. 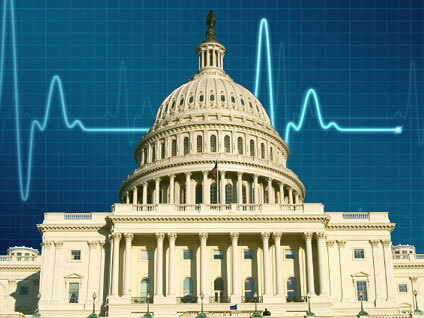 While Americans remain split on the overall health care reform package, many of its specific planks are popular, and Democrats hammered Republicans in the run-up to the vote for seeking to eliminate them. Health and Human Services Secretary Kathleen Sebelius, for example, held a news conferenceto showcase her department's study finding that as many as 129 million Americans under age 65 have some pre-existing medical condition. The health care law bars health insurers from turning away Americans with pre-existing conditions. Republicans are expected to press in the coming months to push for limitations on medical malpractice lawsuits and try to reverse changes to the Medicare Advantage program included int he law. More broadly, they will also attempt to remove the so-called "individual mandate" requiring Americans to purchase coverage, a central tenant of the bill and one that is at the center of GOP-supported court challenges to its constitutionality. Democrats have said they are open to changing the legislation but unwilling to throw it out entirely and start over. Many have said they see Republican efforts to repeal the bill as a second opportunity to sell the law to the American people after falling short in their first attempt. In a statement Tuesday, President Obama said that because of the law, "Americans no longer have to live in fear that insurance companies will drop or cap their coverage if they get sick, or that they'll face double-digit premium increases with no accountability or recourse." He went on to stress the law's tax credits for small businesses, the fact that children can now stay on their parents' plans up to age 26, and what he called a strengthening of Medicare and a lowering of prescription drug costs. Before the final repeal vote Wednesday, Democrats took a symbolic action of their own, forcing a vote on a "motion to recommit" that would mandate that repeal cannot go into effect unless a majority of the House and Senate withdraw from their federal health care plan. Republicans voted down the motion. More than a dozen House GOP freshmen have said they would decline the health care plan. Even if they cannot repeal the legislation, Republicans have vowed to do everything they can to delay or stop its implementation, including denying necessary funds to implement changes to the law. Though some of the legislation's major provisions are already in place, many do not take effect until 2014, including the individual mandate.